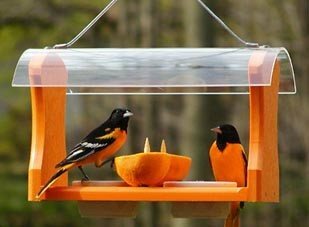 The best oriole feeder for attracting Bullock's, Hooded, Orchard or Baltimore orioles is one that offers both fruit and nectar, with the option of adding grape jelly too. Since Orioles are also insect eaters, you can also offer mealworms and/or wax worms for a complete buffet! Here is a video presented by Duncraft of the fruit and jelly feeder described below so you can see the two trays better and how they can be used. 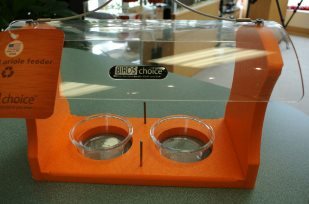 This Fruit and Jelly Feeder is a really nice oriole feeder made by Bird Choice. It also allows you to offer not only nectar, but also jelly and fruit or orange nuggets and meal worms which you can add to the 2 dishes or use the two pegs to attach oranges, apples or pears. It has a nice little roof to protect the feeder and birds from the rain and deflect some of the damaging sun rays off the feeder itself. The feeder is made from thick recycled plastic (yay for recycling!) and can be hung from the heavy duty steel cable. A visitor to our Birdwatching Facebook page posted the below video of his favorite oriole feeder which, you will see, is very popular with the orioles as well as other birds. 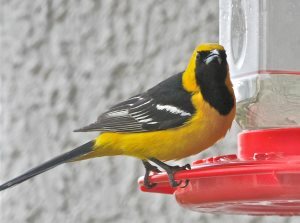 Attracting orioles to your backyard feeders isn't difficult if you present the right food in the right type of feeder. Make sure your oriole fruit feeder is brightly colored, orange or deep yellow colors are good, and is placed in an easy-to-find area in your yard - at least initially until the orioles find it. Baltimore Orioles, unlike other fruit-eating birds (such as Robins who eat all our strawberries!) apparently are picky eaters when it comes to their fruit. 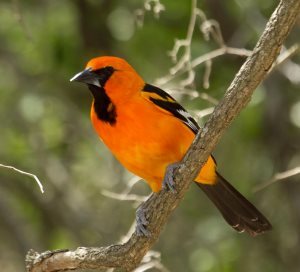 When searching for wild fruit (not our oranges or nectar at feeders), Orioles seem to only prefer ripe, dark-colored fruit. Orioles want dark, red cherries (no yellow or Ranier, even if ripe), deep-purple grapes (they won't eat green grapes), dark mulberries, blackberries, etc.. 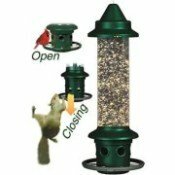 Remember to routinely clean your feeders to prevent bird diseases from being transmitted. Also do not hang your feeder right next to windows (without taking precautions) to prevent bird window collisions. Fruit bird feeders will likely attract other visitors such as hummingbirds, Red and Yellow-shafted Flickers, Cactus Wrens and Catbirds. 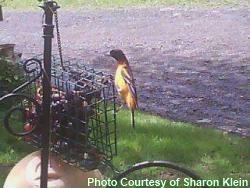 We had a visitor, Sharon, submit this photo of orioles using a large suet feeder filled with grapes. he says she also places orange halves in a smaller suet feeder that the orioles like to feed from too, in addition to red squirrels and woodpeckers. Sharon says the grape feeder also attracts Mockingbirds and Catbirds. I don't normally feed suet during the summer months, so this is a great way to use the feeder to attract other birds during the summer. Oriole Nectar Concentration Same as Hummingbird Food? 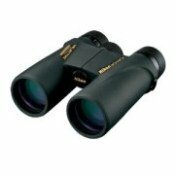 Susan Asked: Hi - I live where we have a huge population of hummers and Orioles, plus Western Meadowlarks and other birds at the nectar feeders. 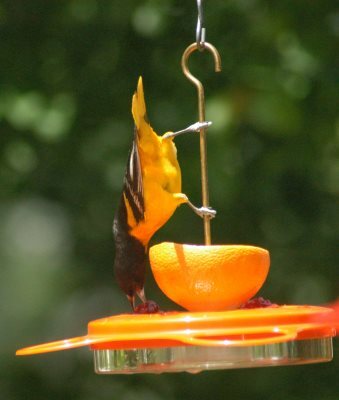 I have a large hummingbird feeder (use 1 to 4 solution) but the Oriole feeder should be 1 to 6. Unfortunately, all these birds switch back and forth from feeder to feeder. Is it OK for the Orioles to have the 1 to 4 ratio? Can I use 1 to 5 for all feeders to compromise? Thanks for your response. Answer: It would be fine to either keep the oriole feeder at 1:6, your hummingbird feeder at 1:4 or have 1:4 for all feeders. 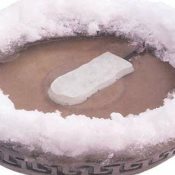 Don't go any weaker that 1:4 for the hummingbirds. If all your feeders were 1:5, you may start to see your hummingbird visitors dwindle. They'll go elsewhere to find higher concentrations in either flowers (or your neighbors feeders!) for their high energy requirements. As for the orioles, the 1:4 ratio will be okay. Orioles, as you know, like grape jelly and I've seen recipes that call for 1 cup of sugar for each cup of grape juice. They seem to have no problems with the sweet grape jelly, so probably won't have any issues with the nectar solution. So, out of convenience, you can make the 1:4 ratio for all your nectar feeders and everyone will be happy. Why the 1:6 ratio is suggested for Orioles? Can't seem to fine the origins or an explanation. I see lots of pages with the 1:6 ratio recipe, but no reasoning. When I was researching hummingbird nectar, the 1:4 ratio is about the same as the flowers hummingbirds are attracted to. So I'm assuming the 1:6 ratio is close to the flower nectar concentration orioles are attracted to. Either that or people found they could save some sugar and still get orioles to visit their feeders! Anyway, the study of hummingbirds found they will eat nectar with concentrations as high as 50%, so the orioles should not have any issues with the higher concentrations either. Barb Asked: How do we keep bees away from nectar feeder? Is there a feeder for them that would do the trick? Answer: Are the feeder ports on your feeder shallow or deep? Have you noticed if the nectar is leaking from them? Are the bees mostly on the ports or other parts of the feeder? Sometimes heat causes the feeder to leak (pushing it up through the ports) or it just leaks out of the main nectar compartment. The leaking nectar will attract bees. If it is leaking out of the bottle, you can use some teflon tape (used for plumbining, like around faucets and showerhead attachments) around the threads to make a tighter fit. "The holes are big enough for the oriole beaks and accommodates hummingbirds, but too small and deep for bees." There is also a discussion in the Q&A on the feeder page where users said they don't have any problem with it leaking and thus not attracting bees. 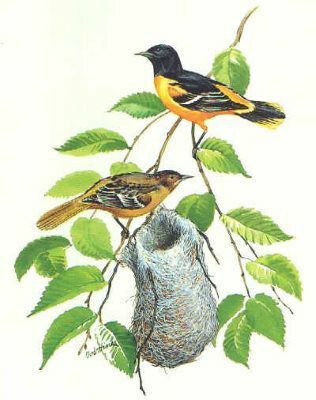 An interesting fact of orioles is that their pendulous nests are one of the most complicated nests built by North American birds. Oriole nest are built near the outermost tips of branches to prevent predators from entering. Hung like gourds, they are composed of carefully woven plant fibers and other similar materials such as fur, hair or even man-made, synthetic items. Both the male and female oriole will build the nest, but it is primarily done by the female. They will take anywhere between four to fifteen days to complete the nest. Hooded Oriole, Altamira Oriole, and Baltimore Oriole nest photos courtesy of Carl BSr and Mark Watson, and the USFWS, respectively.